This dish was made on a cold day, bringing so much warmth in our house. I didn’t have any chance to try beef cheek in Hong Kong until I came here down under. If you’re like me, wanting to explore and expand your dietary repertoire, go for it. If unfortunately, you can’t find any beef cheek available around your area, you can replace beef cheek with any cheap cuts you like, for example, chuck steak is a good choice. The beef meat was slow-cooked until it’s tremendously tender, almost melted in your mouth. The juice inside with the red wind sauce was so wonderfully tasty. After a few mouthfuls, I felt my whole body warming up. Cheers! Cut the beef cheek into 3-cm pieces. Season with salt and pepper. Put the beef cheek with plain flour into a plastic bag. Shake and coat the beef well. Heat oil in a heavy-based pot over medium heat. Shake away the excess flour from the beef. 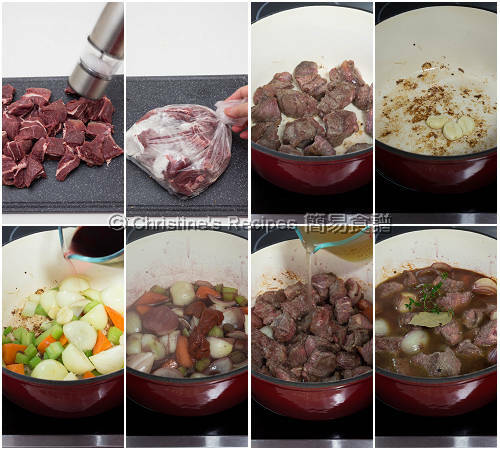 Cook the beef until all sides are lightly brown. Remove from the pot and cover to keep warm. In the same pot, heat oil again. Saute the garlic, onion, carrot and celery. Stir to combine. Cook for about 3 minutes, until aromatic. Add the tomato paste. Pour in the red wine. Bring it to boil. Cook and reduce it by half. Toss back the beef. Pour in the stock. Add the thyme and bay leaf. Cover and bring it to boil. Reduce heat to medium-low. Simmer for about 3 hours until the beef is tender. Occasionally, stir to avoid from sticking to the bottom. Season with salt and pepper. Serve hot. 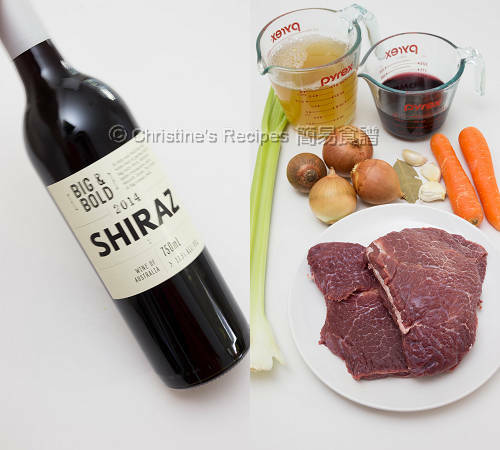 Beef cheek is tough, suitable for stewing, available at supermarkets. It can be replaced by any cheap and tough cuts, like chuck steak. You can use any dry red wine you like. Those beef pieces are really tender and flavoursome! Oh I missed it out. Thanks for asking. I've updated the recipe. 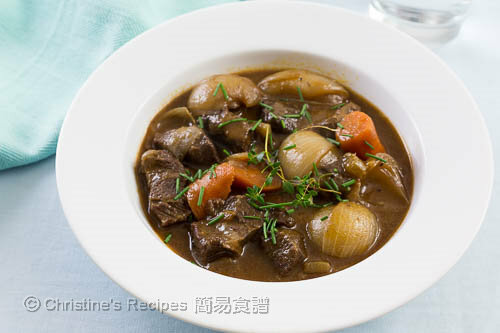 It's a pure French dish with carrots and vegetables, it's called "boeuf bourguignon"
Very nice to have french here. Thanks for sharing. Hi Christine, do you think that this might work in an Instant Pot? 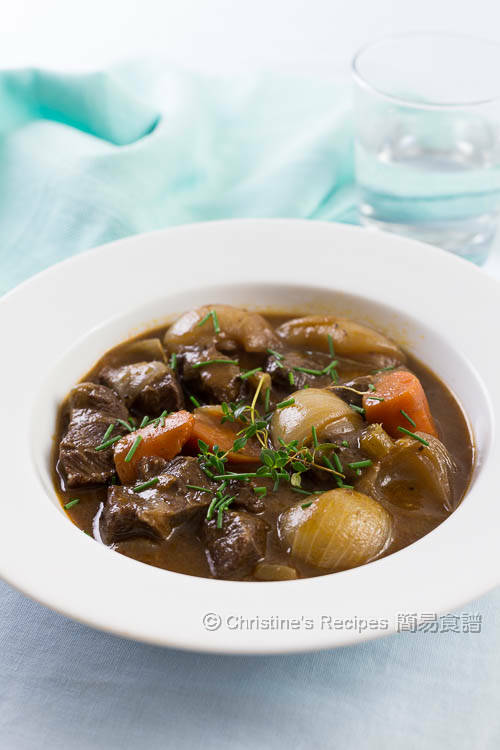 Sure, instant pot works very well with any stew recipes. Yes, you can. Very handy.